ELAEAGNUS EBBINGEI. Hedging Plants, Trees, Shrubs and Conifers. Fast growing evergreen with very attractive, large, leathery leaves metallic grey-green above and silver underneath but when young are almost entirely silver. Many inconspicuous but intensely fragrant, bell shaped, silvery flowers appear in clusters in October and November and these are followed by small egg-shaped orange or red fruits in spring. These are edible and are sometimes known as Wild Olives and are still popular in south-eastern Europe. Ideal for shady, windy or seaside positions, but not cold or wet situations. HEDGE Trim in spring. For hedges 5-8ft (1.5-2.4m). Plant 1.5-2ft (45-60cm) apart. 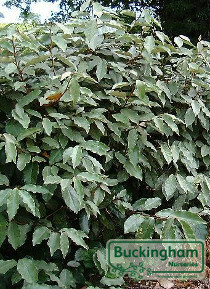 SHRUB 10ft x 10ft (3m x 3m). 20-30cm £3.49 £3.25 £2.98 £2.60 OUT OF STOCK.